Yoshiko Yamamoto says her artistic goal is "always to fuse Japanese design sensibility with fine craftsmanship." Nawal Motawi says of Yoshiko's work: "Yoshiko Yamamoto's art makes your eyes open a little wider and your mind feel a little calmer. We are drawn to her bold, delicate, and elegant simplicity with which she captures her subjects." Yoshiko's design aesthetic is complementary to Motawi's tile designs and "Winter Cardinals" (at right) and "Redwood" (previous page) tiles are beautiful examples. The 6" x 8" tiles are shown framed in Dard Hunter's Legacy quarter-sawn oak frames. 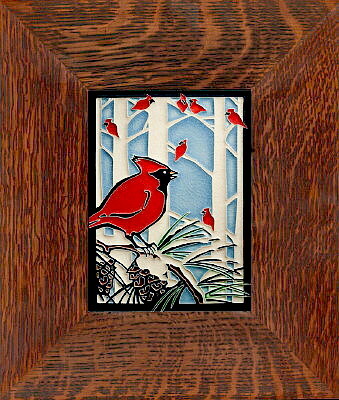 The Spring Chickadees and Ugly Duckling framed Tiles are shown in Dard Hunter's quarter-sawn oak Oak Park frames. What better combination of contemporary Arts & Crafts: a beautiful Yoshiko design on a gorgeous Motawi polychrome tile framed by Dard Hunter quality craftsmanship. Yoshiko's Studio is in Washington state, Motawi Tile are made in Michigan and Dard Hunter's Studio is in Ohio; all USA!